In tonight's game 6 Western Conference Semifinal Series between the San Jose Sharks and Detroit Red Wings Mike Modano will be taking the place of an injured Johan Franzen. Franzen re-injured his ankle during game 5 and did not see any ice time during the Red Wings' third period come back of that same game due to the injury. Bringing in Modano, a Detroit native, could provide the Red Wings with a boost in a game where they face elimination down 3-2 in the series. 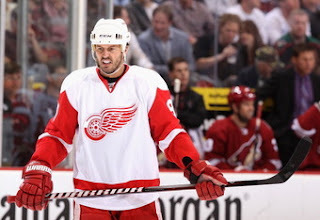 Modano only skated in one game during the Red Wings' first round sweep of the Phoenix Coyotes, where he also replaced Franzen, this addition brings another veteran into the Red Wings' line up. He has played in 136 playoff games through out his 16 seasons playing in the NHL amassing 118 points, scoring 46 goals and acquiring 72 assists. Coach Mike Babcock reported that Modano would be filling in Franzen's spot on the top line with Pavel Datsyuk and Tomas Holmstrom. This could help take some of the pressure off of Datsyuk with Modano being able to take a few face-offs if Datsyuk is struggling. Babcock has also hinted that Datsyuk has injured his wrist, so Modano being able to step into the circle for and injured Datsyuk when needed could be the difference for pivotal face-offs during the game. We'll see what kind of an impact Modano has on the game tonight when the Red Wings try to force a game 7 against the Sharks at 8:00 PM ET on Versus.